Dr. Walkowitz introduces his book. 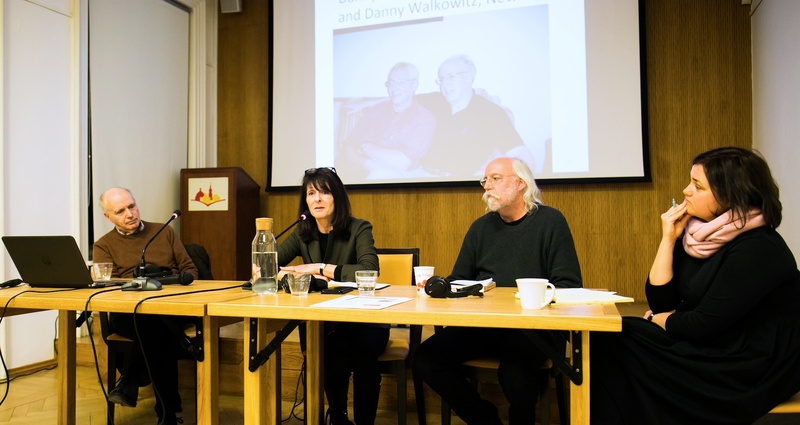 Yesterday, Rohatyn Jewish Heritage had the pleasure of participating in a public conversation with American academic historian and writer Daniel J. Walkowitz, whose book “The Remembered and Forgotten Jewish World – Jewish Heritage in Europe and the United States” was published last year. 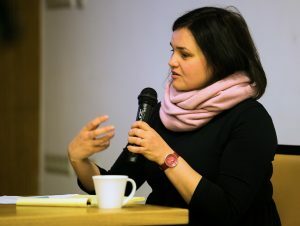 The event was organized and presented at the Lviv Center For Urban History of East Central Europe, and was open to the public; the discussion was in English with simultaneous Ukrainian translation by Svitlana Bregman. After a brief introduction by the Center’s director Dr. Sofia Dyak, Dr. Walkowitz began by presenting a synopsis of his book, backgrounding his personal interest in inclusive representations of Jewish social activism and the evolution of multifaceted Jewish identity at heritage sites on both sides of the Atlantic. Part autobiography, part travelogue, and part a survey of both institutional and independent heritage tourism business, between 2010 and 2017 Walkowitz engaged as a critical tourist with Jewish public history at sites in ten towns and cities in seven countries in Europe, plus New York City closer to home. Dr. Dyak opening the conversation. Raised in a Jewish communist household in New Jersey until Soviet suppression of the 1956 Hungarian revolution shifted his parents’ political views toward democratic socialism, and a radical student activist himself in 1960s America, Walkowitz traveled Europe plus his own “backyard” during the past decade to look for visible public traces of the Bundism, labor, and social justice movements in which his grandparents had been activists in Galicia and partitioned Poland, and then in their post-immigration lives in America. Illustrating his lecture with slides from his travels to his ancestral towns of Mostyska and Lviv in western Ukraine, and Mszczonów (and Łódź) in Poland, he noted the lack of any visible vestiges of past Jewish social life in the places apart from memorial signage recently erected at the cemeteries. 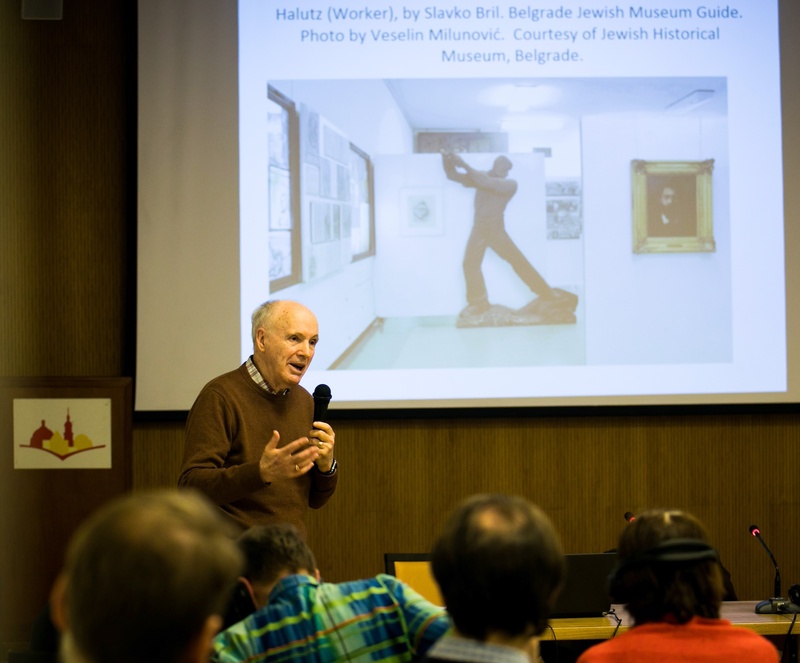 On trips and short residencies as part of his research and teaching profession, Walkowitz also visited Jewish museums, joined one or more Jewish-themed walking tours, and sought out memorials and other physical remnants in each of several other larger European cities: London, Berlin, Budapest, Bucharest, Belgrade, Kraków, and Warsaw; he also spoke with museum directors and exhibition curators as well as tour operators and guides. Although only a small number of the places in which Jewish heritage can be found in Europe, and omitting some prominent larger places with significant Jewish heritage such as Prague, Vienna, and Paris, the geographic and cultural range of the sites he visited gives his critique strength over the period in which he studied the evolving tourism industry. Comparing perspectives brings some humor and appreciation. “The Remembered and Forgotten Jewish World” does not hide the author’s disappointment in the recent museum exhibitions and free or commercial walking tours he encountered. While acknowledging that there have already been changes since his initial visits (such as the opening of the Polin Museum in Warsaw, which Walkowitz praises, and successful recent efforts in Warsaw, Kraków, and Lviv to memorialize “Jewish spaces”), the book presents a rather bleak conclusion that there appears to be little tourist interest in both America and Europe to tell a broader and more inclusive story of the variety of Jewish people (especially for “typical Jews” vs. “great men”), and their concerns and problems as well as their achievements. This of course raises important questions for curators, tour operators, and others connected with the popular and important heritage tourism industry; namely, “whose narrative?”, “whose voice?”, and “whose history of a place?” is being presented and interpreted for popular consumption. Led by Dr. Dyak, the conversation from there touched upon a number of issues related to the business of contemporary heritage tourism, including how Jewish presence and history are conceptualized and represented, how the industry has adapted to changing (even narrowing) expectations of tourists, and how heritage tourism might shift some visitors from a passive role in “edutainment” to more engaged study and self-inquiry. Topics covered both in the book and the conversation included the challenges in developing more inclusive narratives, who decides what is remembered and forgotten in those narratives, and balancing the need for economic sustainability, tourists’ expectations, and funders’ requirements. A collage of panel and audience views during the conversation. As he noted in the lecture and the conversation, a particular concern for Walkowitz is the dominance since the 1970s of Holocaust-connected heritage sites (Auschwitz and others) as travel destinations for Jewish tourists, and the prominence of Holocaust themes at most other heritage travel sites – a problem that, for him, often eclipses the richness and complexity of everyday Jewish life which existed for centuries in those places until World War II. This has been a concern for Rohatyn Jewish Heritage as well, in our work to preserve tangible and intangible markers of the Jewish presence in Rohatyn as well as our presentation of the history and culture of the Jews of Rohatyn as part of the multicultural story of the town on our website, in the exhibition space of the recently-opened local history museum Opillya, and in our planned development of heritage tourism maps, signage, and other aids for visitors of all types. 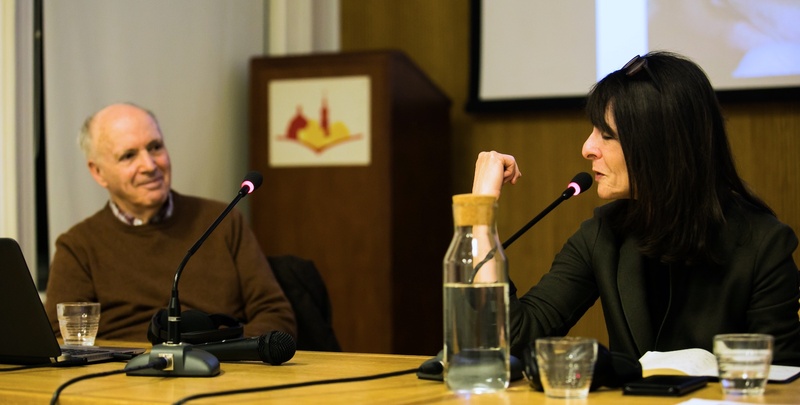 Jay and I would like to thank our friends and colleagues at the Center for Urban History for inviting Rohatyn Jewish Heritage to participate in this important discussion, and also for the delightful and convivial dinner they hosted afterward at Kupol restaurant in Lviv. All photos courtesy the Center for Urban History of East Central Europe / Iryna Sereda. ← Річний звіт про діяльність Єврейської спадщини Рогатина за 2018 р.